The Remodelers Outstanding Construction award by the National Home Builders Association for whole house renovation over $400,000 was granted to New Dimensions Construction for the Engel project in Chapel Hill, designed by Sophie Piesse Architect in a ceremony held on August 6, 2015. In our early design meetings, most clients bring images of spaces that they love to help inspire me; a binder full of lights, windows, fixtures, and hardware is the norm. Cate and Dave, who were looking for a whole-house redesign but wanted to begin with their master bedroom, were no different. Instead of a binder, though, they came with only a single photo of a Japanese hinoki soaking tub. it was this tub, they felt, that should drive the entire master bathroom redesign. They wanted to embrace the total experience that the tub would create: deep relaxation after a long workday and commute. They wanted a functional bathroom that was well-planned, but they also wanted it to be a unique space, something that would reflect who they are. The kitchen Sophie Piesse originally designed for her family home underwent a renovation last year. Fine Homebuilding has added it to their inspiration gallery. The space was ordinary. It was a standard 5'x8' hall bathroom for the kids and guests. It was cluttered and dull. It had cheap finishes that were old and showing it. We needed a bathroom that was fun and functional for the boys and would grow as the boys grew. To save money the footprint was not changed and the fixture layout remained. But, the space was gutted to the sheetrock. A stock tub and under mount sink were selected. The shower valve was reused and matched with a new Delta tub/shower unit. Large inexpensive field tile covers the floors, walls and shower walls to the ceiling (remember this bathroom is for two growing boys!). A remnant piece of quartz was found for the vanity counter and long shelf in the tub (this priced out the same as cultured marble- what a deal!). We also found a great mirror from IKEA. We had enough material left over from the kitchen renovation to build the vanity cabinet and since we could build it we made it what we wanted. Drawers, not doors, to maximize the space and the kick is a third draw that stores toilet paper and has a lid so it can be used as a step stool for the 7 year old. We choose neutral colors for the space, white, gray and wood. Then the kids helped personalize it. We went to New York about a year ago and they had a blast. They decided on a NYC skyline shower curtain, building that tilt out to hold the towels, and climbing men from Umbro decorate the walls and hold the occasional hand towel. A lime furry floor mat fro IKEA was a nice touch. That is the great thing about a neutral palette; simple and easy to make pop with color. As the kids grow we can easily change things out without breaking the bank. Carrboro architect Sophie Piesse likes to talk laundry. Specifically she likes to talk about making laundry rooms function better and have a nicer feel. Marisa Domino and Alberto Scotti hated the kitchen in their home located on a heavily wooded gravel drive off of Old Greensboro Road. So, like many people, they decided to change it. Also like many people who set out to change something in their home, the seemingly simple project snowballed into something bigger: a full-blown kitchen renovation. But here is where Marisa and Alberto aren't like many people. the married couple actually agreed on exactly what they wanted their kitchen to look like. And their taste is anything but traditional. The big reveal is here and published in Fine Homebuilding Magazine's Energy Smart Homes of 2013. Read all about the final project! Green Builder Magazine announces their Green Home of the Year - Best Historical Renovation as the McCullough Residence, renovated by Sophie Piesse. Remodeling a kit home built in 1915 to modern energy saving standards without ruining its "look" required some clever integration. It's not often that a project like this comes along: a relatively sound, historic home that's literally ready for renewal. But architect Sophie Piesse and this homeowner found just such a property. The century old house had been abandoned mid-renovation, but not before much of the worst tear-out work was complete. The owner purchased the home with no wiring, plumbing, insulation or drywall in place. Many of the structural amenities, flooring, stairs and windows were half-removed or in bad shape. Teaming up with builder Trip Renn of Actual Size Builders, she redesigned the home with LEED Silver certification as a goal. The ubiquitous toddler step-stool is remade for the modern home here. LEED – Leadership in Energy and Environmental Design – is the US Green Building Council standard that allows buildings to be rated for “green-ness.” We want to use this project to help educate Chapel Hill about green building. Follow this site to watch this old house jump 100 years into the state-of-the-art present. One challenge of a historic house is what to do with the historic electrical wiring and plumbing. The previous owner’s gutting of the house removed those particular decisions from our purview. However, between those historic studs we installed state-of-the-art, safe and efficient wiring and plumbing that will hopefully last another hundred years. A major aspect of Green Building is that you build to LAST! Sending more materials to the landfill in 20 years is not cost-effective, and wastes the embodied energy contained in the materials, as well as the materials themselves. (Embodied energy is the energy required to make and transport the materials to you in the first place.) So, part of building green is to NOT be “penny-wise and pound-foolish” -- do it right and it will save you money in the long run. As you remember from our previous issue, inside the exterior skin, we used spray insulation to add R-value and seal cracks which would steal heat and cooled air. We used an air-sealing package with which we sealed around all the plates and gaps to stop air infiltration. A new insulation made from recycled soda bottles was used between floors for sound insulation. After the pre-insulation and insulation inspections, we hung sheetrock. So, we decided to keep, but close off, the original fireplace and put a new state-of-the-art gas fireplace across from the old. (These can vent directly, and so don’t need a chimney.) Then we created two “matching” hearths. A “chimney” structure around the new fireplace to match the old, a door on the old fireplace to match the new, with matching mantles and surrounds, and the charade is complete. Since a major project goal was for the house to look (if not feel) as old as it is, the team saved what original materials could be saved and diligently searched for re-useable materials and objects add to that old ambiance. This also fulfilled another aspect of green (and source of LEED points) -- using reused or recycled materials to give new life to old things and save that embodied energy. The whole team contributed to the reuse goal. The original 5-panel doors, porch columns and staircase newel post, while covered with lead-paint, were too beautiful to discard. Safe lead-paint stripping was not cheap, but definitely worth it. Because Trip Renn, the builder, is EPA-certified to remove lead paint under the new regulations, we didn’t have to worry about it. (Lead paint is quite toxic, especially as a neurotoxin for developing children’s brains.) The half-glass back door is also original, but the glass was not safe or energy efficient. A double-insulated panel was installed to make the door more energy efficient. Elbow grease and a coat of paint for the underside were enough for the original claw foot tub. The owner found some wonderful old sinks to lend authenticity to the kitchen and baths. The kitchen cabinets are different pieces used from another of Sophie’s renovation projects and artfully put together and augmented by the Actual Size Builders carpenters; Joe Bell, Gordon Gress and Josh Moore. The pantry units are made up of upper cabinets, old single paned glass windows and a lot of attention to detail. Sophie’s own home addition provided surplus bamboo for the guest room/study, as well as the french door which leads from the living room to the porch. Trip is a self-confessed “wood nerd,” and saves not only wood left over from other jobs, but also tiles and assorted other treasures. His wood filled in missing gaps in the existing heart pine flooring (along with some additional reused heart pine from Pittsboro). The built-ins and mantles were built with some beautiful red oak from Trip’s “stock.” The gorgeous kitchen island and several vanities were hand built using oak cleared fromMelissa’s previous lot (and dried in her previous carport) and crafted with care by a great group of skilled carpenters: Mike Lanier, Ed Ralston, John Kingsley, Joe Bell, Gordon Gress and Josh Moore with the help of Brendan Galvin. Trip also had an assortment of stone tiles (with which he had redone his own shower in a wonderful patchwork of complementary granites). This treasure trove provided stone for a limestone/granite floor and accents for the guest bath, as well as the kitchen backsplash. The remnants rack at a local granite store provided a beautiful counter for the master bath vanity area. Finally, some old decorative tiles from Greensboro Architectural Salvage will hold soap and towels in the guest bath. Where possible, new materials purchased were selected for recycled content. The kitchen countertops are Richlite, a solid surface made with recycled paper and created by Dave Banko of Counterpart LLC in Raleigh, and new tiles throughout the house have recycled content. These recycled content tiles are from Common Ground Green Building Supply in Durham, which also supplied paint and floor finishing. Common Ground sources many other green building materials, like flooring, countertops and cabinetry. Finishes are a major source of toxic emissions in homes. Paint, varnishes, polyurethane, vinyl flooring - these are the things that create that “new house smell.” Unfortunately, that new house smell isn’t good for you, especially when sealed into an energy-efficient house. So this project used non-toxic materials. For starters, we used Mythic® paint, which is a non-toxic, ultra-low odor paint. For another application, Melissa had heard of a natural ebonizing method for wood. Put steel wool in white vinegar for a week and it will create a lovely translucent black finish on wood. Using some of that previous-lot white oak, the builders made two beautiful ebony-looking vanities. And finally, rather than finishing the floor with polyurethane, even a water-based polyurethane, we used a new non-toxic finish which will look like an old floor. AFM Naturals Oil Wax Finishapplies more easily, like an oil, and uses pine resins to create a durable finish. A major advantage of this finish is that, when the inevitable accident happens in one spot, you don’t need to refinish the whole floor, just retouch that one spot. Bringing the function of the house into the 21st century meant energy and water efficiency. Appliances are all Energy Star, as are fans and most light fixtures. Period-looking lights are from Schoolhouse Electric, crafted affordably here in the USA. Light cans are equipped with LED bulbs that screw in a regular socket. (LEDs or Light-emitting Diodes, and depending on the use are approx. 80% more efficient than incandescent and about 50% more efficient than fluorescent). These were made by Cree, a Durham company, and picked up at Costco for $30. They should save about $150 over the life of the bulb). Non-LED bulbs will be fluorescent. More efficient bulbs not only save electricity, they emit less heat so your air conditioner doesn’t have to work as hard, saving even more energy. Materials, finishes, appliances, energy and water efficiency -- that catches us up to the present, Green reader. Tune in next time for the finishing touches and commissioning of the house. The Bahnsen-Herzenberg house was built in 1915 and was an identical Aladdin kit home to the neighboring house at 8 Cobb Terrace. Located in downtown Chapel Hill, it is close to UNC and Franklin Street, public transportation, farmers markets, great restaurants and many cultural opportunities, while being located on a quiet street with open woodlands in its immediate view. The home was purchased while half-way through the last owner’s renovation, demolished down to bare studs with no plumbing or electrical in sight. Our desire was to create a healthy, energy efficient and environmentally friendly home, as appropriately and respectfully as possible. We are on track to certify the house as LEED for Homes at the Silver level. We are striving to achieve LEED Gold. The certification process involves a good team; the lead members include architect Sophie Piesse, builder Trip Renn ofActual Size Builders and the homeowner Melissa McCullough. We are guided by the LEED provider and green rater, which in our project are the same, Southern Energy Management. This home is also in the Franklin-Rosemary historic district of Chapel Hill. This meant that our first hurdle was to get through the Historic District Commission. Since our plan was to renovate the home in keeping with its original style and integrity, this turned out to be a pleasant experience. The Board seemed delighted that we were really trying to preserve and restore as honestly as possible. Aside from an 8’ addition along one side of the first floor by the previous owner, the house retains the original form. The shell of the existing house will remain mostly intact. New aluminum-clad, double-paned, insulated, low-e windows will fill the original positions as much as possible while still complementing the updated interior. Casement windows were chosen for a tight seal and their ability to direct natural ventilation. They have simulated divided-lights, so they look like windows typical for the architecture of the home. The new roof is a light tan Energy Star rated 5V metal roof with high reflectance to help reduce energy bills by reflecting the sun’s heat without being so bright that it is a distraction to neighbors and passing motorists. Metal roofs have a very long life, are low maintenance, made from recycled materials and are recyclable themselves. A new EPA regulation requires renovations of pre-1978 buildings to be tested for lead paint, and if present, requires careful removal and disposal. This is because lead is a potent neurotoxin, especially for growing children. Our tests found that the exterior did indeed have lead paint (the interior of the house was bare). The paint was pealing off the siding and the siding needed repair so we decided to remove all the siding in accordance with the EPA guidelines and re-side the house. This did give us the opportunity to significantly improve the insulation. We wrapped the house in 1” Styrofoam for added insulation and a thermal break to the wall system. (A thermal “bridge” is created when materials that can conduct heat or cold link outside to inside; the thermal break prevents that conduction.) We were also able to put house wrap (Tyvek) on the house and furring strips behind the siding to allow for air-flow to ventilate the siding, which is great in our humid environment. The new siding will be smooth Nichiha siding, a fiber cement siding) with the same look as the original siding. The brick foundation walls and chimney were also covered in lead paint. We used a non-toxic paint stripper to remove this. We could not sand blast the brickwork because of the toxic dust it would produce and although scraping and repainting was an option, taking the paint off completely would repeat the original look of the original brickwork and create a long-term low-maintenance option. A big item in green construction is Forest Stewardship Council (FSC) certified wood, which is certified to be grown and harvested sustainably. This was a tricky item for us. Since it was a renovation, the amount of wood required was somewhat unknown. To buy FSC certified wood, we needed to buy it in large quantities. This was not advantageous since we wanted to disturb as little of the site as possible and having large staging areas covered with wood was not a great option. We opted for local wood instead. We could buy in small quantities, getting just what we needed, when we needed it, while supporting local businesses. All the scraps are sorted and reused where possible for blocking etc. It is our plan to restore the original beauty to this wonderful old home and to make it a real asset to the street and the neighborhood. We chose LEED as our guide for a holistic approach to green building. We wanted a thoughtful process using current building techniques, intelligent design and a creative team to revitalize this beautiful home. Please follow us during this exciting process. David and Adele Roth were in the process of renovating their kitchen and bedroom in May 2008 when lightning struck and destroyed their home. See what came up from the ashes. 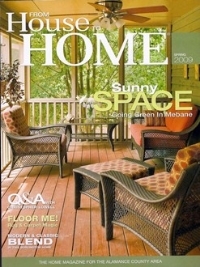 The Wiggins/Williams renovation appears in the Spring 2009 issue of From House to Home. This is one of the earliest articles about Sophie Piesse's work. The article is about the home she designed as a newlywed and mother-to-be.